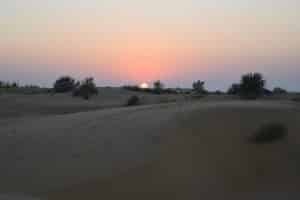 It’s possible to go on a desert safari in the Thar Desert near Jaisalmer. You can chose to go for a whole night or an evening in the Thar Desert and experience a camel safari and jeep safari. Once you arrive you can enjoy food in a desert camp under the starry sky of Jaisalmer. Sleeping directly under the starry sky is better than a fixe star hotel. There is something magical about the whole experience; going on a camel ride, arriving at your camp between the sand dunes and sleeping under a million stars. 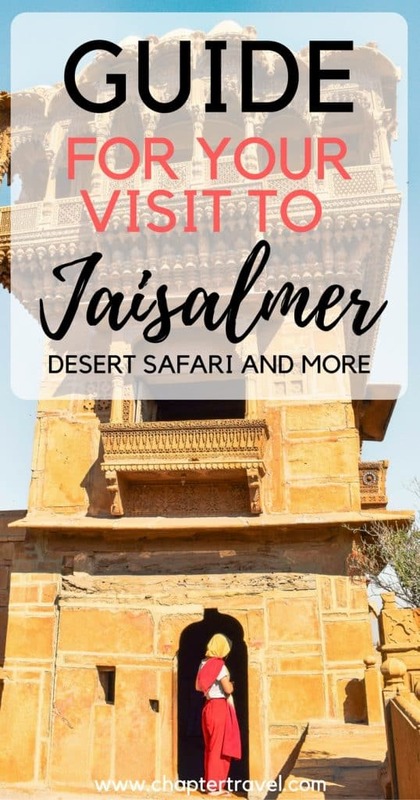 In this article we share some facts about Jaisalmer and the Thar Desert, the best time to visit Jaisalmer, our experience with the desert safari in Jaisalmer, whether it’s ethical to ride camels, and we share 3 other fun things that you can do in Jaisalmer. Because Jaisalmer is not only fun because of the desert safari! In addition, we share a great hotel and restaurants in Jaisalmer! Jaisalmer, also known as the Golden City, is a remote city, located in the southwestern region of Rajasthan amid the Thar Desert. Although it’s remote, it’s still one of the most popular places in Rajasthan for tourists. As it’s a popular place to visit, it’s definitely easy to get there. 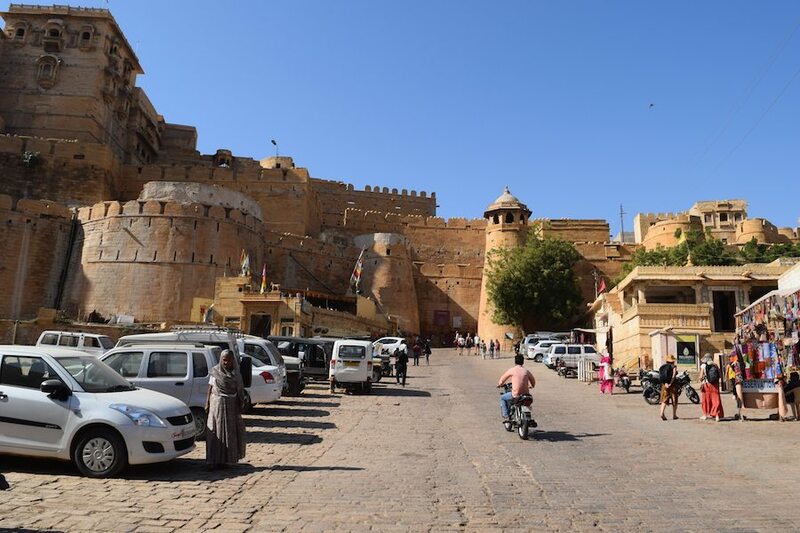 One can reach Jaisalmer by bus, train, car or even by air – if you would fly to Jodhpur and get a ride on a bus or train from there. Jaisalmer is a place with a rich history. The city was established by the Maharaja in 1156. Legend tells that it’s founded by a man named Jaisal, a Bhatti Rajput ruler. It’s said that he did it in assignment of a local hermit called Eesaal. The Trikut hill was chosen as the place for the fort, as it seemed a good site to prevent possible attacks by enemies. The Thar Desert is also called the Great Indian Desert and is the natural border between India and Pakistan. Jaisalmer is located in the Thar Desert, making it a perfect location to visit the Thar Desert on a desert safari. 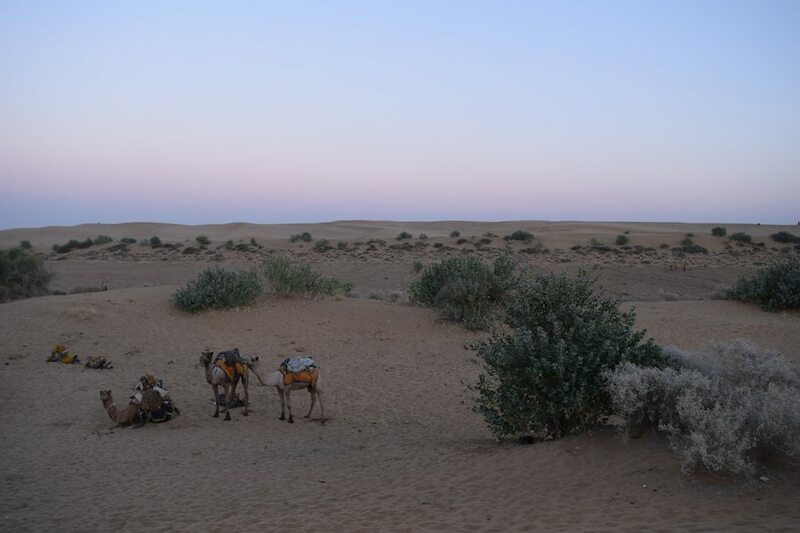 Did you know that the Thar Desert is the 18th largest subtropical desert in the world? It’s over 800 kilometer long and 400 kilometer wide, spread over four Indian and two Pakistani States. The Thar Desert is also the most populated desert in the world! 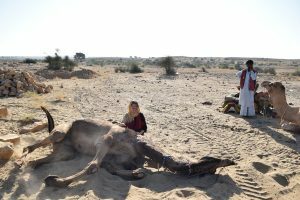 For more facts about the Thar Desert, be sure to check out this article by Beautiful World. So when is the best time to visit Jaisalmer? Of course it depends on what you would like to do. In general, October until May is considered to be the best time to visit Jaisalmer, because it’s not too hot or humid. Below we will share the climate conditions of Jaisalmer so you can make up your own mind when is the best time to visit. From November until February is the winter season in Jaisalmer. This doesn’t mean it’s cold, but it’s actually a more pleasant temperature! During these months it’s more enjoyable to go on a desert safari in Jaisalmer, because the temperature generally doesn’t exceed 25 degrees Celsius. From March until August is the summer season in Jaisalmer. Overall, this is not considered to be a good time to visit Jaisalmer. The temperatures in these months are around 25 – 42 degrees Celsius, making it hot and harsh. These high temperatures are because of the close proximity to the Thar Desert. As it’s so hot, it’s a lot less pleasant to go on a desert safari or other touristic activities during this season. From September until October is the monsoon period in Jaisalmer. Temperatures vary from 5 – 24 degrees Celsius. Even though it’s monsoon, there is not a lot of rainfall in Jaisalmer during this period, just low rainfall or no rain at all. The low rainfall does cause more humidity in the area. When October starts, the weather is perfect as it’s cooler, so it’s one of the best times to visit Jaisalmer. October is also the start of the tourist season and it gets busier. Going on a desert safari in Jaisalmer is definitely a highlight when visiting India. Spending a night in the desert is definitely an adventures experience! Imagine the sunlight beaming on your skin, massive sand dunes, an amazing sunset with gorgeous views, and ending the day sleeping under the starry sky. Plus, the next day, you’ll have an amazing sunrise and another camel ride back. We really enjoyed the whole experience. We slept right under the stars without any tent, and it was a lot easier to sleep than we initially thought. It’s possible to do a half day or two days (one night). It’s even possible to spent a whole week if you want! A half day usually includes visiting the desert by camel and watching the sunset. When you spent the night, it’s the same, but you also sleep in the desert, get to watch the sunrise and get breakfast. We decided to sleep in the desert, and we booked it via our hotel Tokyo Palace Hotel, and absolutely loved it. There are also more luxurious options when going on a desert safari in Jaisalmer! You can also go clamping with all the modern amenities. For instance with the Jaisalmer Desert Resort where they offer deluxe tents. There is not much to bring if you only go for just one night, like we did. Our hotel covered most of the essentials, such as food – dinner and breakfast, mineral water, mattress, blankets and tent (if you want one). You need to take sunglasses, sunscreen, long sleeve shirts and warm clothes for if it gets cold at night. We also brought basic hygiene products such as toothpaste and a toothbrush, and it’s also recommended to take cleansing tissues, as there won’t be any water taps for you to clean your face. To be honest, I wasn’t sure at first how I would feel about riding on a camel. Yes, it seemed fun, but how ethical is it? I know there is not much taboo about riding camels, but I’m not a big fan about animal tourism in general. And I would rather not participate in it at all. Most of us know about the abuse of elephants in the tourism industry, but what about camels? So, I did a little research and found an organisation online called SPANA. Their main focus is improving the welfare of working animals in the world’s poorest communities. You can read more about this organisation in our post Is it ethical to ride any animal at all? Luckily, I soon discovered the camels we had were treated very well. They didn’t hurt them in any way, plus they have lots of freedom. During our dinnertime the camels actually went their own way, walking around in the desert and eating plants. They went so far that we couldn’t see them anymore, and one of our tour guides had to “ask them” to return by yelling “EYEYEYEY”. So it was nice knowing they have the option to drift around by themselves when they aren’t “working”. And decide to come back after. Thus, I guess the best answer to the question whether it’s ethical is: it depends on how they are treated. But still, I’m not sure if I would ride an camel again. You never know how they are treated when you’re not around. The fort of Jaisalmer is the second oldest fort in Rajasthan, a massive structure and therefore hard to miss. It’s made of sand stones, like many of the other buildings in Jaisalmer. The architecture is beautiful, and we absolutely love all the sandstone buildings in Jaisalmer. In the fort you can find houses, temples, shops, hotels and lots of restaurants. Unfortunately, during recent years, the fort has been facing large conservation problems due to unrestricted water use. This is caused by the large amount of people living in the fort plus the growing tourism. Therefore, we decided not to buy, sleep or eat in the fort, nor do we recommend you to do that. The government is trying to offer subsidies for local people to leave the fort, but they rather stay and make more money out of tourism. However, we did have a look in the fort and it was a very special place, with amazing views of the desert. It’s completely free to enter the fort of Jaisalmer. This is a lovely refreshing place in Jaisalmer, where you can enjoy a peaceful boat ride or just enjoy the scenery. Around the lake you can also find temples and other impressive buildings such as shrines and ghats. 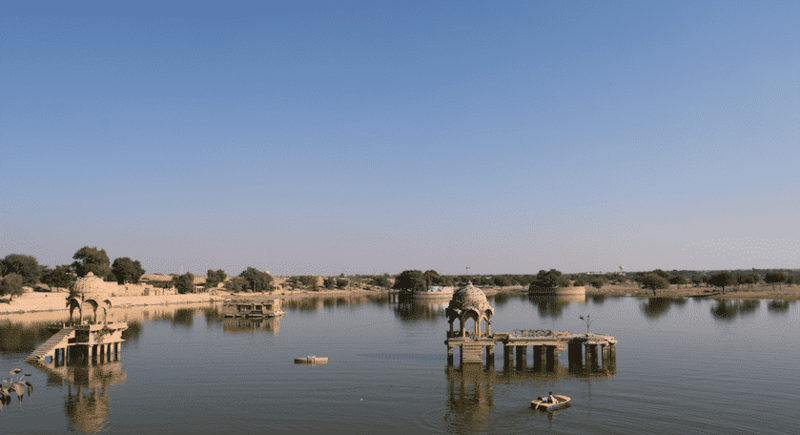 The Gadsisar Sagar Lake was the only source of water for the city in the olden days. We particularly liked the gate right before you reach the lake, called Tilon-Ki-Pol, or Gate of Tillon. This beautiful sandstone gateway arches on the road and creates a nice frame before the lake. It was hard to capture this beauty, so it’s best to see it for yourself in real life. 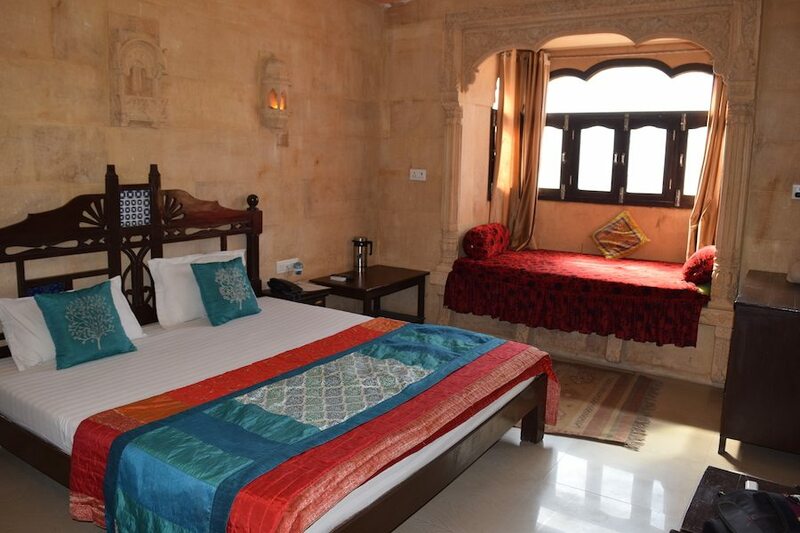 Salim Singh-ki Haveli is located in the heart of Jaisalmer. 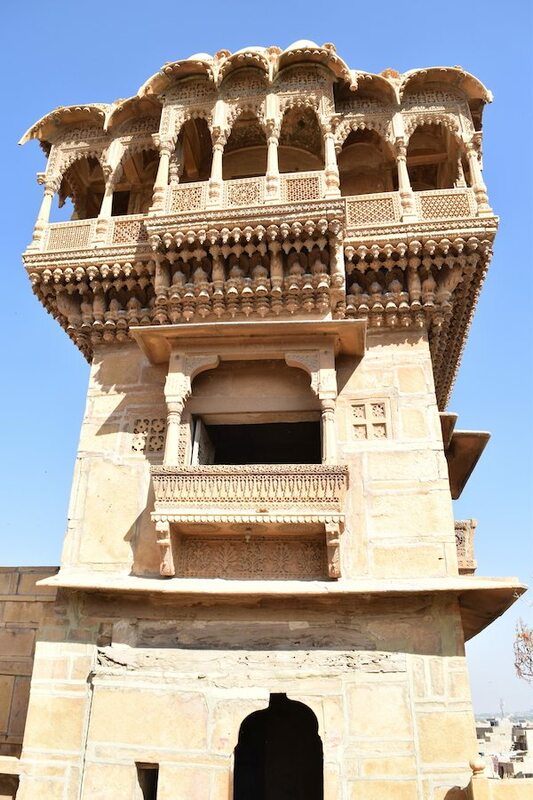 It was commissioned by Salim Singh, the Prime Minister in the time that Jaisalmer was the capital, and was build on the remains of an older haveli in 1815. The most influential family of that time, the Mehta family of Jaisalmer, occupied the haveli. The haveli has a very unique architecture, as the first floors are very narrow, and the top of the building is a lot bigger. The large top of the haveli has beautifully carved out details, and balconies with an arched roof in the form of peacocks. To get into the Haveli you only pay 30 rupees per person, and 20 rupees extra for your camera (so about 0.60-0.70 $USD/euro in total per person). We found an amazing hotel called Tokyo Hotel, which has a beautiful engraved golden facade, gorgeous rooms and a view on the fort from their rooftop restaurant. The hotel is located only five minutes walking to the fort, and you can book your tours via them. The hotel has 15 rooms, and five different types of rooms that vary from dormitory to deluxe suites. The first two nights we spent in the normal room. The price was a bit more than we usually pay per night in India, namely 900 rupees per night (about 12 $ USD/euros), but also a lot bigger and cleaner. The shower was hot and the WiFi was overall good, although in a few instances the connection failed. Today we got back from our desert safari and they were even kind enough to upgrade us from a normal room to a standard room. The standard room is pretty much the same, but looks a bit fancier. See picture above for the standard room. Here we had a little break from the overload on Indian food, and had a delicious pizza. Good Italian food is quite rare in India, so we were very happy to have found this place. In addition, their restaurant is on a rooftop with a great view, they decorated it nicely with fairy light, bringing a nice vibe to the whole place. It was very quiet when we came, so it was also a very relaxing place for us. The hotel we stayed in also has a great roof top restaurant. The thing we liked most was the interior and the view of the fort! We had a good basic breakfast each day, and dinner was good too. There are so much more restaurants in Jaisalmer that you can try out. Be sure to go to one of the many rooftop restaurants and enjoy the surroundings! 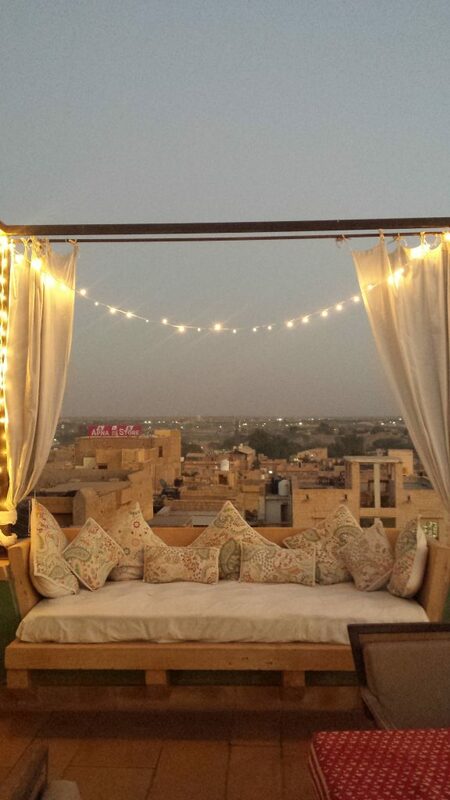 For more inspiration, check out the 10 best restaurants in Jaisalmer. Have you ever visited a desert or went on a desert safari in Jaisalmer or elsewhere? Share your experiences below! Hi ! I’m planning on going to Jaisalmer next week and I’m bit worried about finding safari tour where the camels are treated ethically, if you liked your tour could you please give me the name of the company you booked it with (if you remember it)? Thanks! Hi! We booked our tour via our hotel and felt they were treated well. But still, I would look over recent reviews, since it could be they no longer use the same agency for their tours.. This was over a year ago. It was Tokyo Hotel, the one we mentioned in our blog. Oh that is great! Too bad you only have one night, but Tokyo is definitely worth it :). There are some cheaper options in the city but I really liked the service and the rooms! I never thought about ethics with Camels… it makes sense to consider how thier treated! Thanks for the thought! Wow. This is so pictursque! Never been to Jaisalmer. Camping and walking across the dunes of the desert sounds so romantic. Adding it to my must-see list. beautiful blog!!! and amazing pictures!! 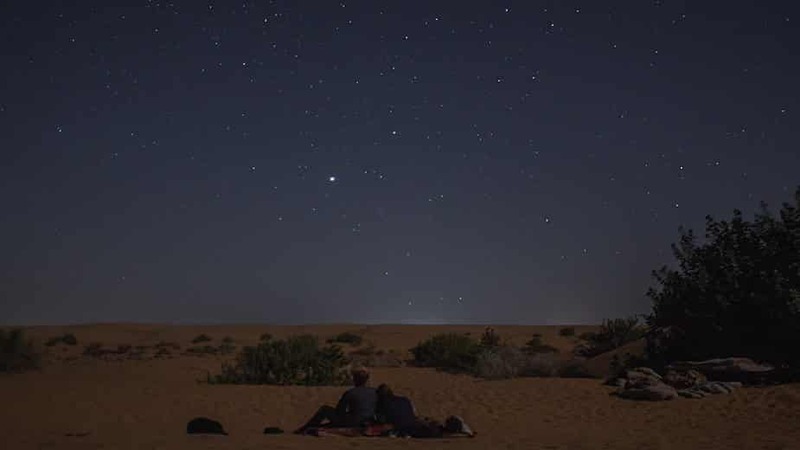 riding camels, camping between sand dunes, and sleeping under millions stars are my dreams! definitely will as Jaisalmer to my bucket list. Wonderful tips! thanks for sharing!!! Thank you May, so happy you liked it. Also, thank you for your kind comment!